Communicating from a place of love will help get your message heard. 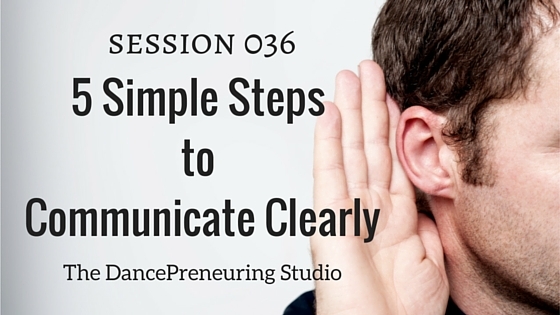 In this session of The DancePreneuring Studio, I share 5 simple steps to communicate clearly so that your words and actions are honorable to all those involved. Make sure you have a plan to execute idea to implementation. And get started, no matter how small. 1. Write all your ideas down, no matter how trivial or massive they seem to be. 2. Make a schedule to review them regularly. Some ideas will not be exciting anymore and it’s okay to cross them off your list. 3. Be flexible if necessary on the execution. Allow for detours. Minimum: What can you do that is a no-brainer, that you know you’ll do no matter what? I used the example of doing one push-up a day for a week. Target: This is the middle range goal that you can shoot for, that can require a bit of a stretch. In my push-up example, maybe this could be 3-5 pushups a day. Outrageous: This is beyond what you can see, but it’s still a possibility. What do you think about 20 push-ups a day? The Dancers’ Dialect: Dance terminology as it relates to life and business. This week is not a term but a process buy cheap tramadol online that I know you’ll find helpful. Whether it’s marking or going full out on choreography, focus on one thing you want to work on each time. Maybe the first time it’s musicality, maybe the second time it’s the counts, and then maybe the third, will be emotional interpretation. It’ll be different for everyone. Freestyle Flow: I talk about the importance of facing conflict and still treating others with kindness even if they don’t treat you respectfully. 2. Show respect and kindness regardless of the subject matter. Address the situation, not the perceived shortcomings of a person. 3. Realize that everyone is your superior in some way. Not that they are better than you, but they might know something in some other area that you don’t know about. 4. Don’t be afraid to apologize. What communication steps can you share that have helped your life and your business?